As the summer sun adds to our annual ‘blood boiling’ fest, now more than ever is a time for cool heads and dispassionate analysis of where we are on this long and winding road towards peace, prosperity and political maturity. Given the gravitas of events surrounding the parades dispute in north Belfast it is hardly surprising that widespread condemnation falls on elements within the PUL community, particularly in relation to the violent attacks on our first responders. Yet, in moving beyond the traditional political analysis, adapting a more salient evaluative critique of current events may help to discern the chrysalis of a new non-violent era for Loyalist conflict transformation slowly emerging and forming in the cocoon of this current crisis. To view this transformation it is necessary to move beyond the stereotypical loyalist lens and discern developments through a social capital frame. Loyalists, having learnt the lessons of conflict transformation, are beginning to employ the tools, technologies and techniques of peacebuilding to shape a new PUL society at the local level. 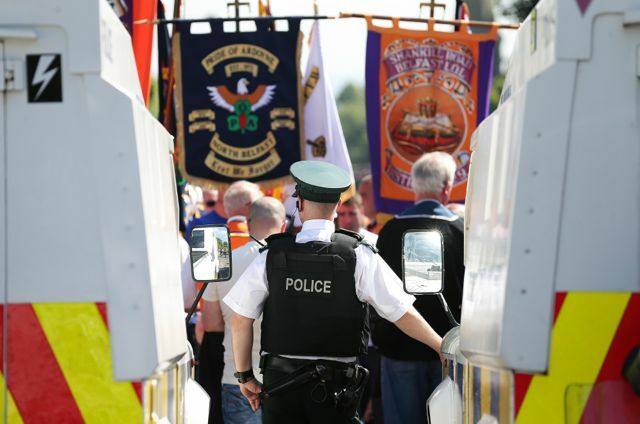 This ‘grassroots’ transformation now arising, in response to the HET, flags and parades disputes, appears to be bonding ‘grassroots’ loyalists, bridging their internal identity disputes, and linking them to their politicians, local Orange lodges and civil society groups. In so doing ‘grassroots’ loyalists are slowly beginning to frame a common vision of what a shared cultural future could look like and how they develop a strategic response to the perceived cultural war now being waged by Sinn Fein. This vision is not shaped on any notion of a ‘Third Protestant Ascendency’ but on the dreams of the Protestant working class, striving to realize their prize promised in the Good Friday Agreement: to address the deep-rooted causes of conflict, eradicate victimhood, poverty, unemployment inequality, cultural and social exclusion and the creation of conditions for further sectarian violence never to erupt again. However, fifteen years on from the Agreement the promised peace prize has yet to impact in ‘grassroots’ loyalist areas and communities, particularly in north, south, east and west Belfast. Instead of securing a new era, of social and cultural inclusion, the Loyalist community has witnessed their parades systematically attacked. As a consequence, ‘grassroots’ Loyalists are now slowly reorganizing their social capital to secure their culture. It is now becoming clear that through new logics, strategies and tactics, ‘grassroots’ loyalists are beginning to ‘return the serve’ in this growing perceived cultural war between the PUL community and ‘others’, this time using non-violence, legislation, the courts and community action, as their preferred tools for acquiring cultural equality and human security. The street disorders arising from the Parades Commission’s determination preventing the Ligoniel Lodges returning home have been a godsend for the reformers of this new Loyalist programme for social transformation. The disorder helps progressive loyalists expose the futility of violence in trying to obtain cultural equality. It also helps undermine ‘super prods’ attempts to lead ‘grassroots’ loyalism up yet another hill: only to get less at the pearly gates than St. Andrew gave them last time. As this non-violent re-construction of social capital slowly re-profiles the PUL community it is inevitable that organised Loyalism will increasingly place constraints and tolerances on their elected politicians, moving them beyond the ‘moving statues’ theory of cultural conflict towards a more salient critique of how social and cultural inclusion is shaped, secured and agreed in a shared out sectarian state. Socially motivated ‘grassroots’ Loyalism also adds a new inclusive non-violent community action element to forthcoming discussions and negotiations on how a ‘second-generation’ Agenda for Peace will be shaped through the impending Haas initiative. While current political analysis dismisses ‘grassroots’ loyalists and the Orange Order as only 2% of the population and having little impact on forthcoming negotiations, a more sober realization is that if 1% of the world’s population can own 40% of the world’s wealth what can 2% of socially organised loyalists own? As Professor Pete Shirlow notes, with the end of Ulster Loyalism greatly exaggerated, if ‘grassroots’ loyalists are to emerge from their ‘sloth-like past’ they will need to ‘create a new form of un-armed political loyalism upon the foundations of key and social justice driven principles’. Through this current crisis we may just be witnessing this emergence of political loyalism through the building of ‘’grassroots’ loyalists social capital. If ’grassroots’ loyalists are to succeed in developing social justice in this emerging form of progressive unionism then it needs to formulate a coherent strategy and tactics with the leadership to deliver cultural equality. While this emerging ‘grassroots’ loyalist social transformation movement may ultimately fall foul to the fate of other PUL social equality initiatives, thwarted by Ulster Unionist political elites, its gradual growth offers new insights into how progressive unionism will rise to meet other challenges, of poverty, ill-health and multiple deprivation. Therefore, rather than viewing this current crisis as a stereotypical violent loyalist response to social change, a more cool headed and salient critique may detect the chrysalis of a new non-violent era for the Loyalist community emerging from its ‘sloth-like past’. If so, in developing this new era of non-violent loyalist social transformation, ‘grassroots’ loyalists might yet provide the vision and leadership to show how a local application of social action and social capital can begin to transform ‘grassroots’ loyalists, from violent defenders to social menders, and in so doing, change utterly, the drive, dynamic and development of our post-conflict peacebuilding society. If progressive loyalists can keep their head while others around them are losing theirs, to shape a shared vision and provide the local leadership to achieve the non-violent aims and objectives that secure cultural equality, we might yet see a new dawn emerging from the cocoon of our current crisis. This new dawn, of ‘grassroots’ loyalist social transformation, may then even reform our staid sectarian political economy, to secure the hope of 98 and deliver social and economic well-being for all those most in need, to move us all a little further down this long and winding road towards peace, prosperity and political maturity. ← Where have all the young men gone? An excellent piece, Sean. For too long Loyalism has been reactionary but I sense too that something is changing. If the constitution comes down to a sectarian head count then protestants will be a minority soon and the game may be up. If unionism can make Northern Ireland “work” i.e. a place catholics feel comfortable in, then the union may be maintained long term. A massive amount of compromise will be needed and I’m not sure the headbangers will accept that but I will be watching NI21 and the PUP closely in the coming months to see what they do. Most informed people know of the demographic shift alluded to in Killick’s comments, however very very unfortunately they don’t seem to in PUL areas, nor is anyone seemingly making an effort to help people smell the proverbial coffee. What as a local living in Inner City East Belfast I fear is those from outside the province that fund all manner of projects, see recent disorder and chaos as proof of the ineffectiveness of very very significant investments; and when cut backs happen post the next UK election make savage cutbacks to an electorate to whom they are not accountable, afterall no mainland politician will lose office if all of N Ireland libraries close, half of its leisure centres or whatever. Nullifying the Orange Order is the only way to move the PUL community forward. The social moulding they hide amongst tradition promotes the divide they need to abandon. It also is at the heart of this ‘loss of identity fear’. I actually think it will get worse before it gets better as the Orange Order is dealt with. But it will be the right step and ultimately could lead to peace. Watch for the Flanker from SF through ROI too. I thought the article was a bit wishy washy, and needed more meat on the bones of the points your making. While I would welcome a more progressive and constructive form of loyalism there is no proof of it emerging. This article reads more like wishful thinking repeatedly tantalising us with visions of a metaphorical chrysalis of grassroots loyalism – but with nothing in the article to back up this assertion. How exactly are these new loyalists ‘returning the serve’? Where are the non-violent methods being honed to achieve cultural equality? Where is the cultural inequality that necessitates this. I realise the article states they are embryonic in nature – but surely the author could at least give us a few examples? In the absence of some concrete examples – this is a nice piece of writing with nothing to say. I personally think that Loyalism’s real problem is it’s failure to enter into the realities of the 21st century. For years there was “Jobs For The Boys” “March Where You Wish” society for them, with the protestant upper and middle classes happily employing their working class “coreligionists” (To quote big Ian). They enjoyed a 90% protestant RUC, (a 50-50 PSNI is now “biased against prods”). A protestant government for a protestant people. Remember that? The problem is, we now live in a UK that is hogtied by the European system. Equality Law is no longer “optional”. Law and Order no longer skewed in one direction or another. No more diplock courts (with a few exceptions for dissident republicans), the UK government, although it can, as it always has, espouse a unionist position, it can no longer simply dismiss as a “terrorist community” the 35% -40% who hold Irish nationalist views. The UK government is now almost fully engaged with these “terrorists” on a democratic footing. That’s because it is! It IS a constant chipping away… a chipping away of the old orange state that once denied people rights based on their community background, that allowed sectarianism to run rife, that allowed sectarian marching to happen anywhere the marchers felt like it… that denied voting rights to a section of the population… etc. etc. All that is being chipped away at. Not by Sinn Fein alone, but by the realities of the 21st century. The PUL have bigger problems the the sinners.